Are you loving the collab between Wool and the Gang and Rowan? Us too! From our limited edition Stone Washed Yarn to the patterns we made just for this launch, we’re pretty jazzed about the new collection. Let’s take a closer look at our dreamy lightweight yarn and how you can use this premium cotton tape gem to create fashionable pieces for your growing wardrobe of handmade knits. Our Stone Washed Yarn underwent an unusual dyeing process in Italy – which gives it the unique washed out look we love. Plus, the yarn’s faded-out appearance works perfectly with the denim-inspired shades! From the beautiful Navy Aged to the dreamy Light Aged, we’ve got the perfect blue hue for you. These colours are showstoppers on their own but also look bangin’ together. Who doesn’t love a little blue on blue? This collection is the perfect transition into warmer weather. From lightweight tanks like Forever Young to much-needed layers like Corrina for those cooler evenings, these patterns are sure to become staples in your spring wardrobe. (Free patterns available here!) Let’s take a closer look! The Scoop: This sweater will become your new go-to, with a lovely marled effect worked in over the rib stitch. We love the use of two blue shades throughout the piece, giving it that little somethin’ extra. The Scoop: Take a look at that low back! This intermediate pattern really showcases the premium cotton tape yarn. The full-length dress is easy to wear, yet so stunning. The Scoop: Fringe up your life! 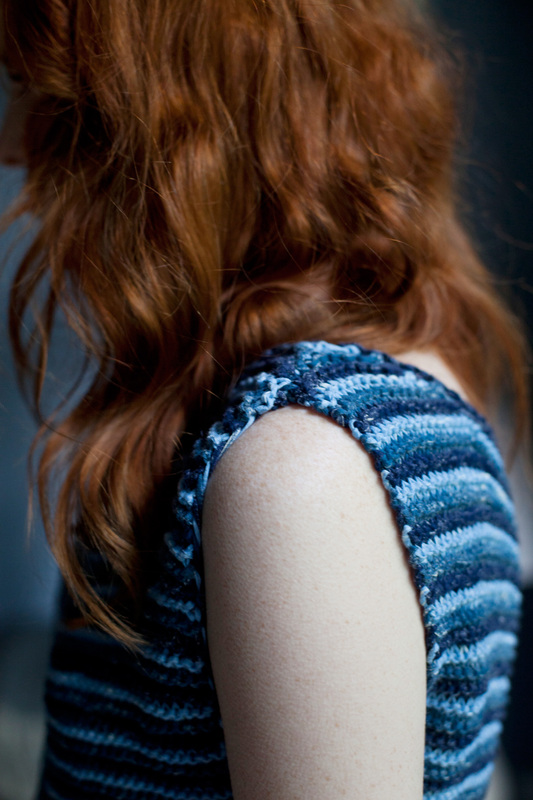 This fun tank is an easy kit to knit, and a much-needed statement piece for your summer wardrobe. Plus, we’re obsessed with the tank’s stripey detail throughout – using three shades of the Stone Washed yarn to create such a powerful colour combo.